Next to keeping your fingers attached to your hands, easily the most important thing in regular woodworking is keeping things square. I can’t count the number of times I’ve gotten myself in trouble over the years by being lax about this. The cure to out of square is painful, time consuming and often fruitless. “Oh, it’ll be alright” is the faint siren song in your memory as you look in dismay upon your project. This is what I do for a living so it’s worse than it sounds. To that end there are many traditional aids to success. 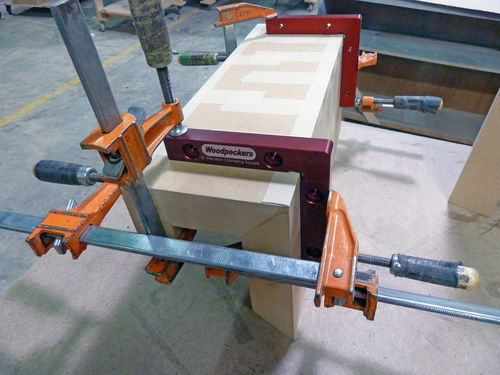 Metal squares naturally, measuring diagonals, meticulous machine setups and for this review a pair of precise clamping blocks from Woodpeckers. For that’s needed sometimes, clamping up against something that you know to be square. Woodpeckers is a remarkable company, offering many thoughtful well machined products designed for our craft. These blocks are no exception. Sized at ¾” thick, 1” wide, 6” x 6” and CNC machined from solid aluminum with slightly radius-ed edges and with corner relief (for them and for us), they’ll convince your wood that it’s hip to be square. Hard anodized for durability and non-reaction to any glue. Their accuracy is beyond my measuring capabilities. Now I know what you’re thinking. 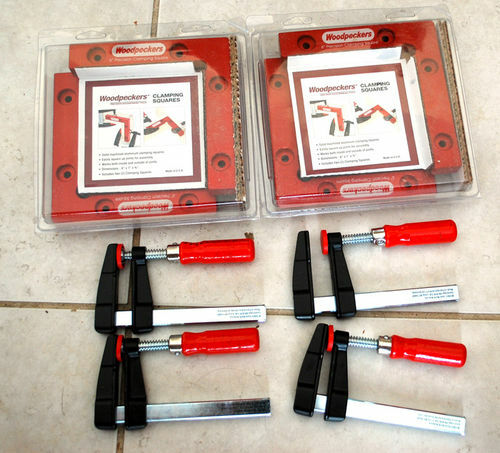 Why would I buy these when I can make perfectly good corner squares out of wood in my shop? Well I do that too but only for inside squares. There you may have a substantial gusset or rib giving great strength and repeatable accuracy, all because you have the luxury of a long inner diagonal. Outside clamping with wooden aids is another story. Your members must be massive in relation to metal in order to prevent flex and the joinery is difficult to make ‘precisely’ 90 degrees, with any corrections over time being equally difficult. 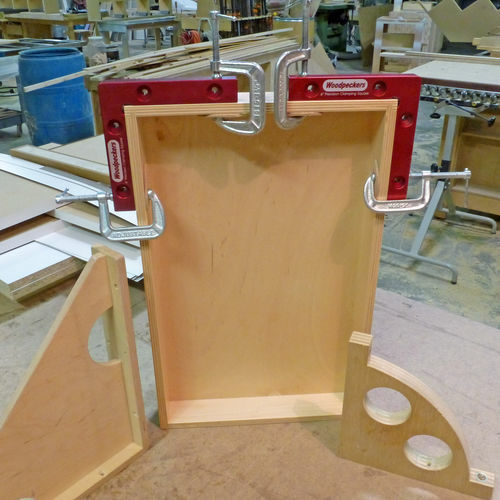 The compact nature of Woodpecker’s product often means not overwhelming your project with blocks and clamps. The metal ones will go into small spaces much more readily as well. Another nice feature to these blocks is they are pre-drilled for screwing to your bench or a setup board, allowing you to push into them for assembly on repetitive tasks. Nae cheap for sure and don’t use them everyday but what price the gloom at viewing your ruined work? Made in usa, by those crafty usans. Check out their One Time Run tools. There may be something of interest to you as this is an innovative company always trying new things. Ooo, at first look I thought those prices were for each one (different sizes) but it is for packs. This is the kind of tool I like to invest in – you know it is square and true and do not ever have to suffer the after effects of a knock against the workbench. And I like that they are red! Not only my favorite color, but easy to spot. These are going on my shopping list. Laughing my irascible arse off, Gene ! It looks like you’ve got caught in the corner a time or two. I’ve used these a couple of time. I like them too. Band saw, 19 mm plywood, clamping squares for next to nothing…... Heck I can even get my machinist to make a few for about half the price. It is a good idea but woodpeckers are going nuts with their prices. Thanks Gene, always a joy. Hmm, I am looking at life differently now. Fantastic review. Everytime I get a “little” money ahead I buy something from Woodpeckers or Incra or somesuch place as that. Haven’t been disapponted yet. As to the cost: You want quality? You want American Made? You want someone to do research and development for you? It’s going to cost you. And the Woodpecker folks are entitled to their profit. Sigh. 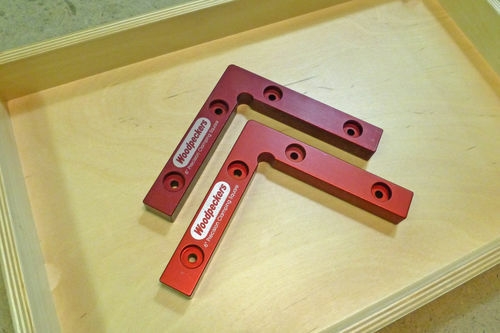 Looks like these Precision Clamping Squares might be next on my wish list. Good point about the relative strengths of the shop made and the woodpecker framing squares. Thanks for the review Gene. 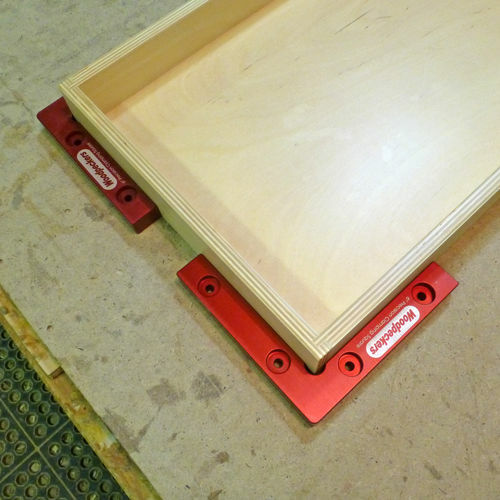 I have a Router Lift from Woodpeckers and really enjoy the quality of their products. I have a few sets and love them. I have yet to be disappointed with any of my Woodpecker purchases. You need to pick and choose or the wallet will go thin but great quality. I bought my router table and lift at the NJ show and got a Micro adjust with it that still does not show on their web site. IT makes the super fence a great fence in my opinion. Nice pic, I laugh. Will we have an “unboxing” video on YouTube? You get great reds with that Nikon.